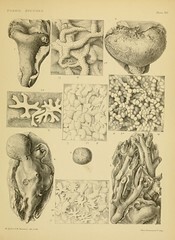 George Jennings Hinde, 1883. 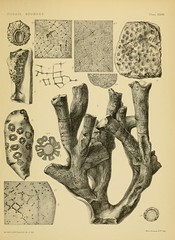 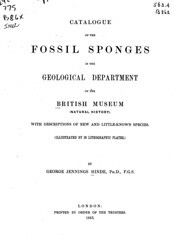 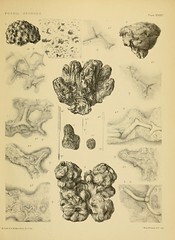 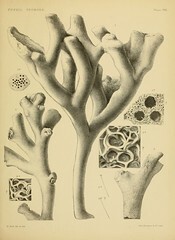 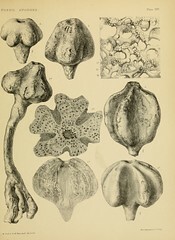 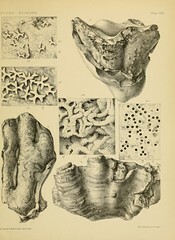 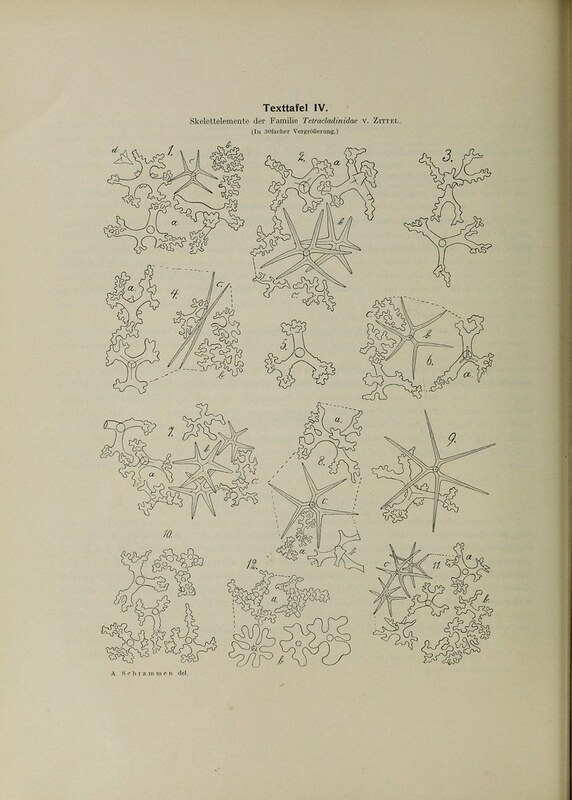 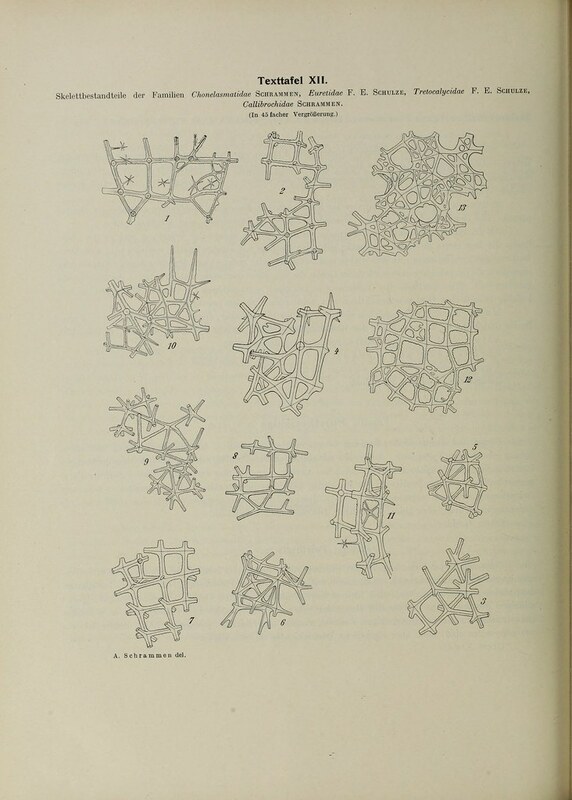 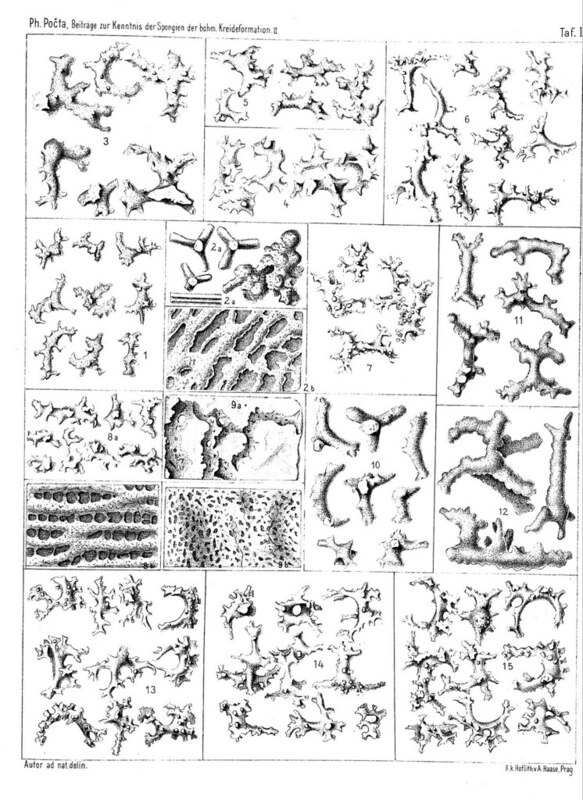 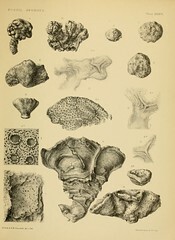 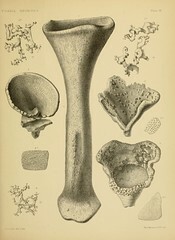 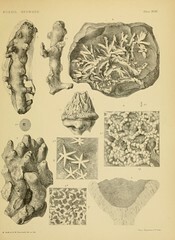 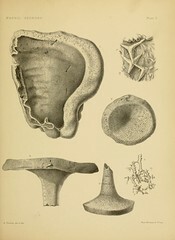 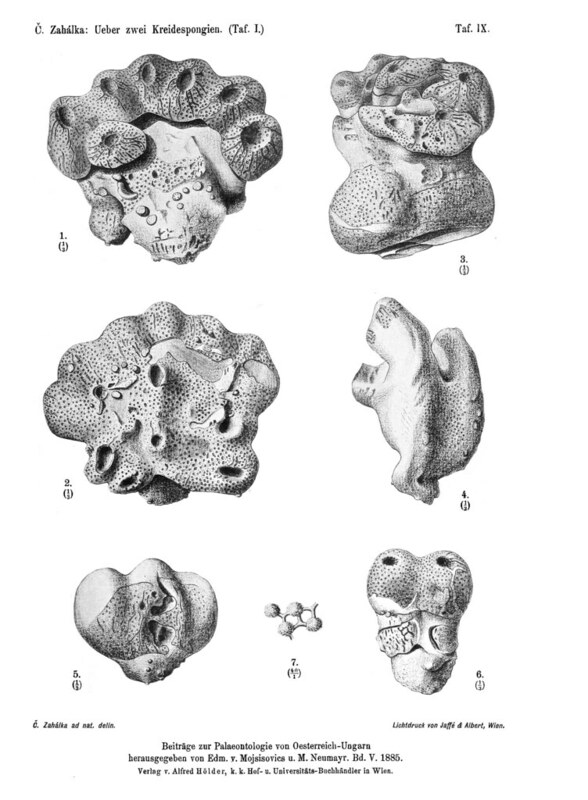 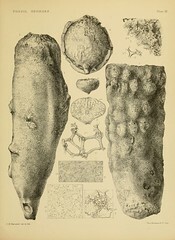 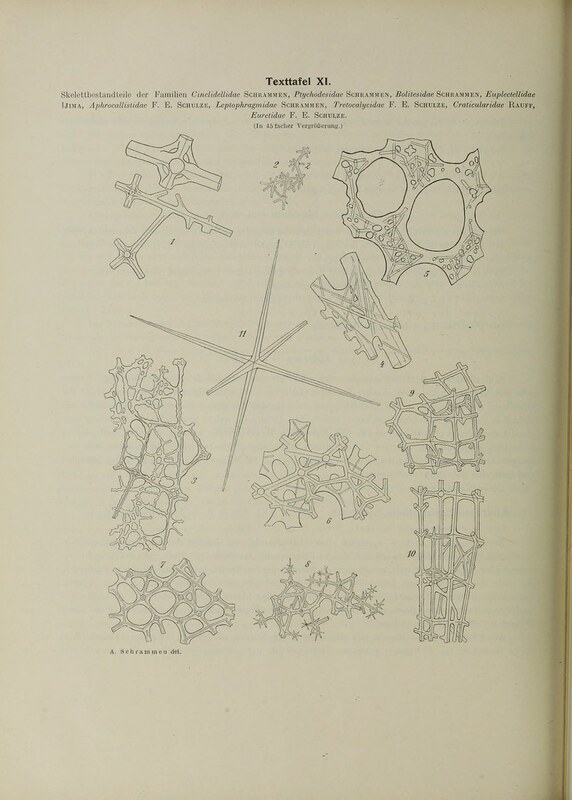 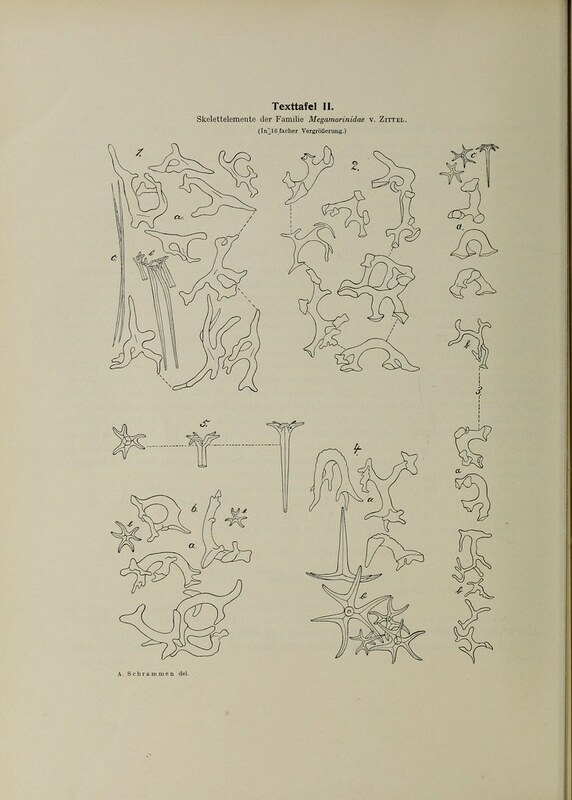 Catalogue of the fossil sponges in the Geological Department of the British Museum (Natural History). 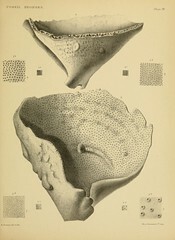 (Printed by order of the Trustees) London: 1–248. 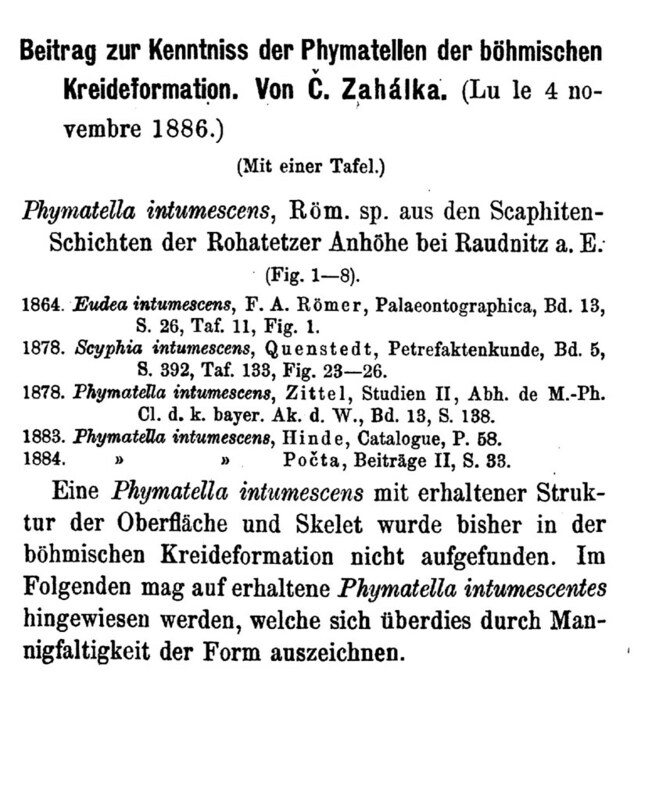 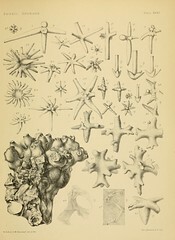 Professor Zittel includes in this genus fan, palmate, or funnel-shaped sponges, with projecting oscules on the upper or inner surface of the wall, and with small pore-like openings on the lower or outer surface. 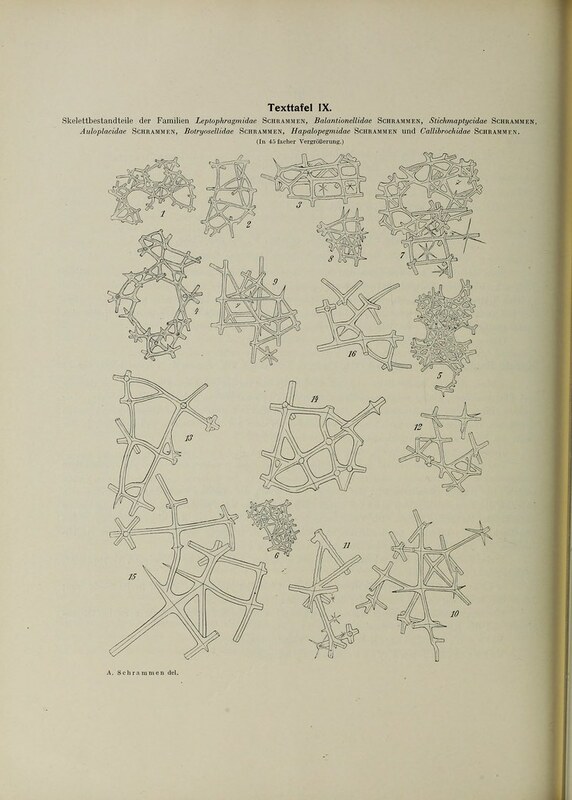 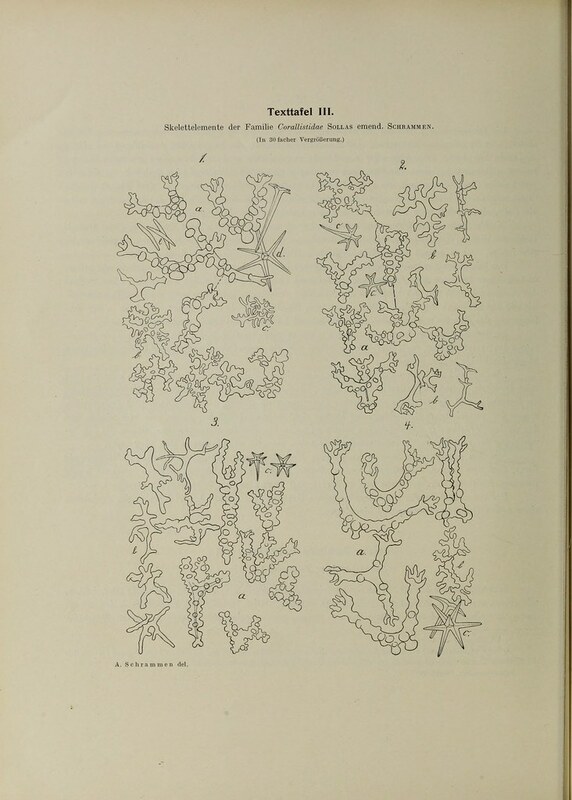 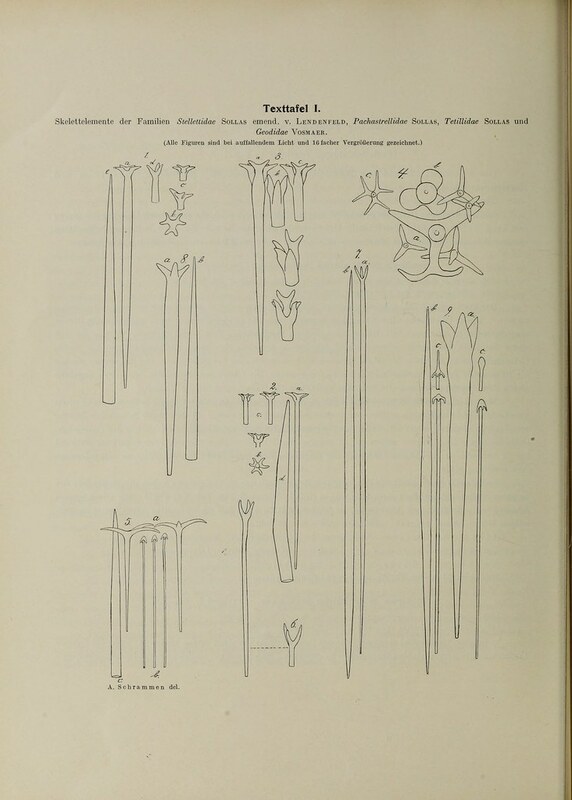 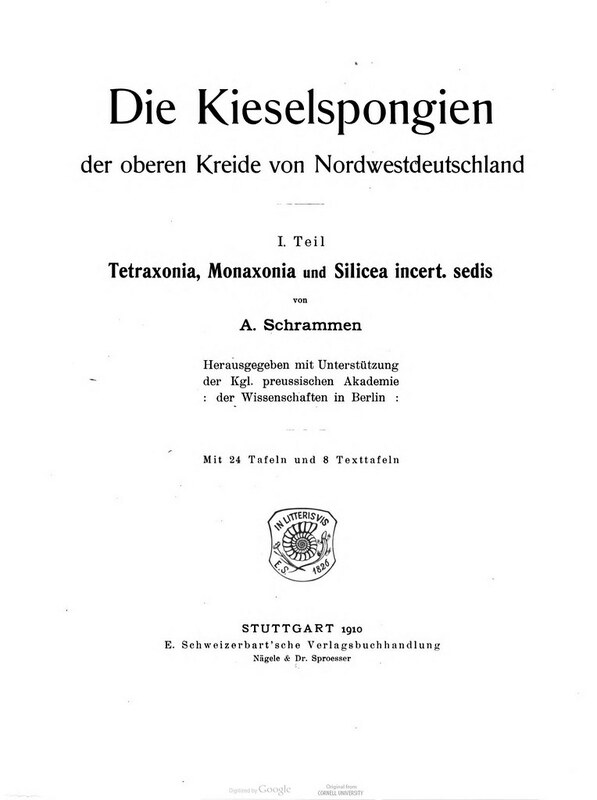 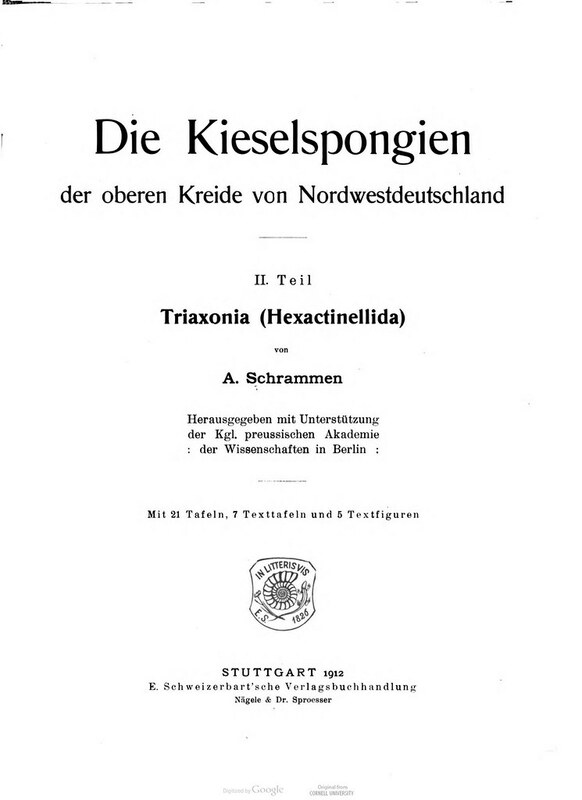 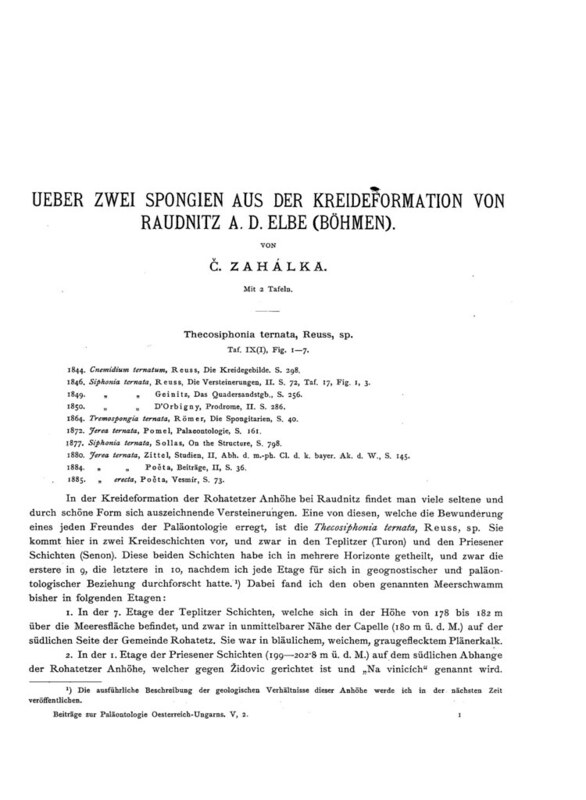 For sponges similar in form, but with oscules on both the upper and lower wall-surfaces, Zittel constituted the genus Amphithelion, but at the same time acknowledges that the differences between it and Verruculina are hardly more than of subgeneric importance. 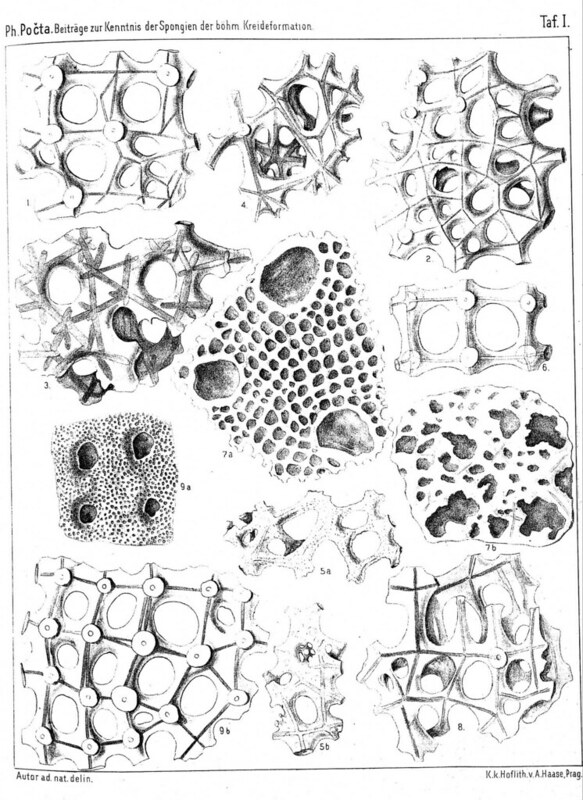 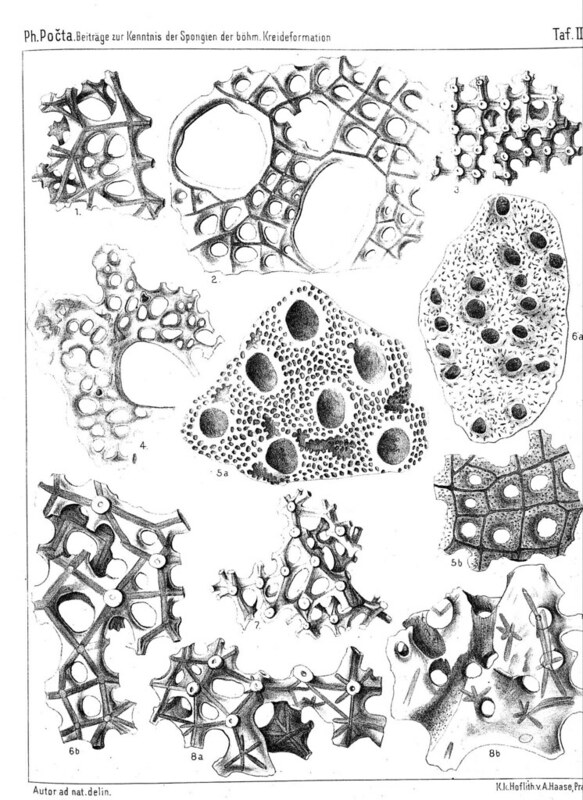 In practice, however, I find that these differences are very difficult of application; for though in typical forms the distinction between the oscules of the upper and the pores of the lower surface of the sponge is sufficiently clear, there are many examples in which it is difficult to determine whether the canal apertures of the lower surface have the characters of pores or oscules. 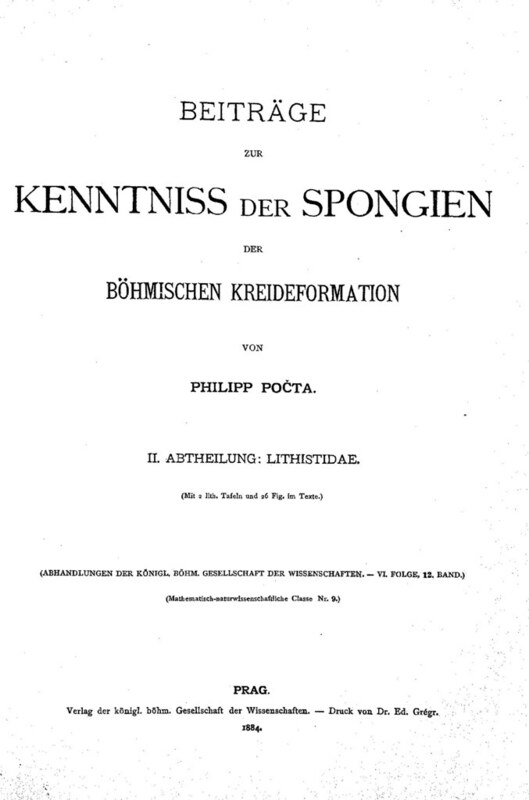 I therefore propose to relinquish the genus Amphithelion and to include the sponges placed therein in the genus Verruculina. 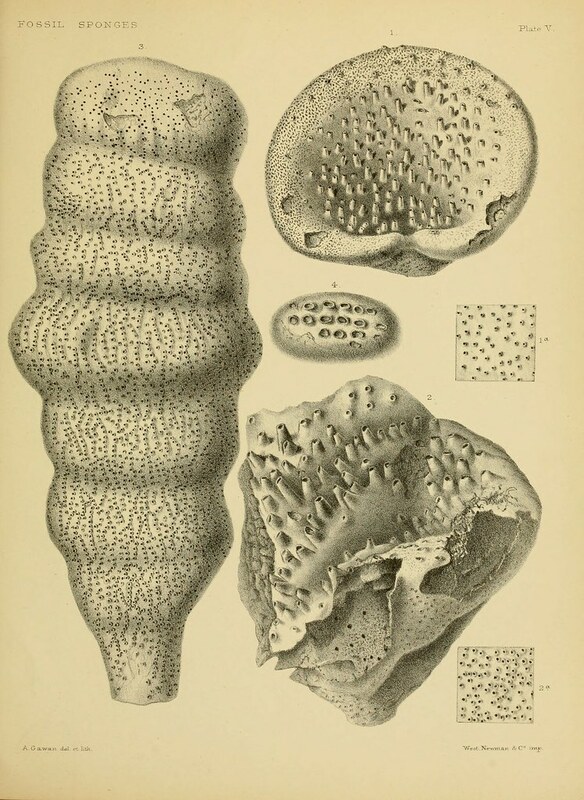 The definition of this latter genus will thus have to be extended so as to embrace sponges which, in addition to the projecting oscules on the upper surface, are furnished either with pores or oscules on the lower surface of the wall. 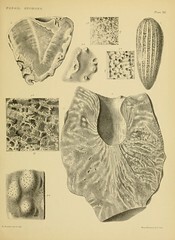 There are very numerous examples of this genus in the Upper Chalk of Flamborough and in the Middle and Upper Chalk of Germany and Bohemia. 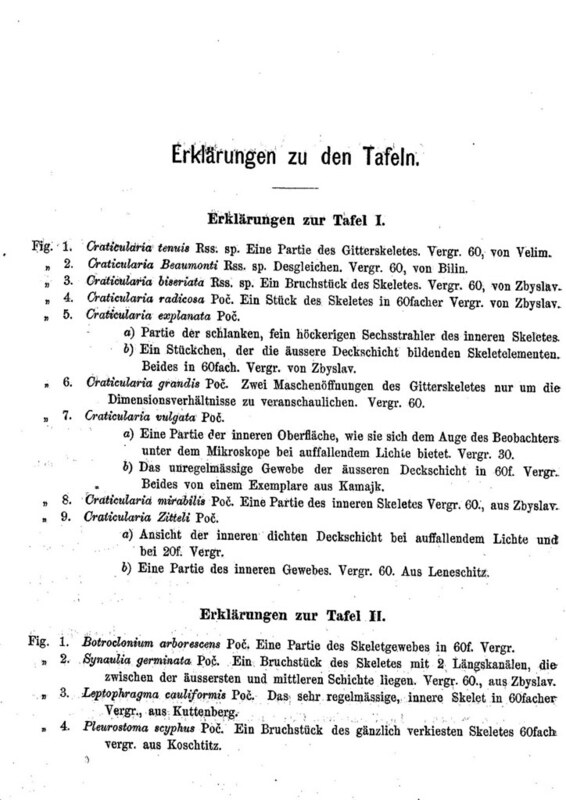 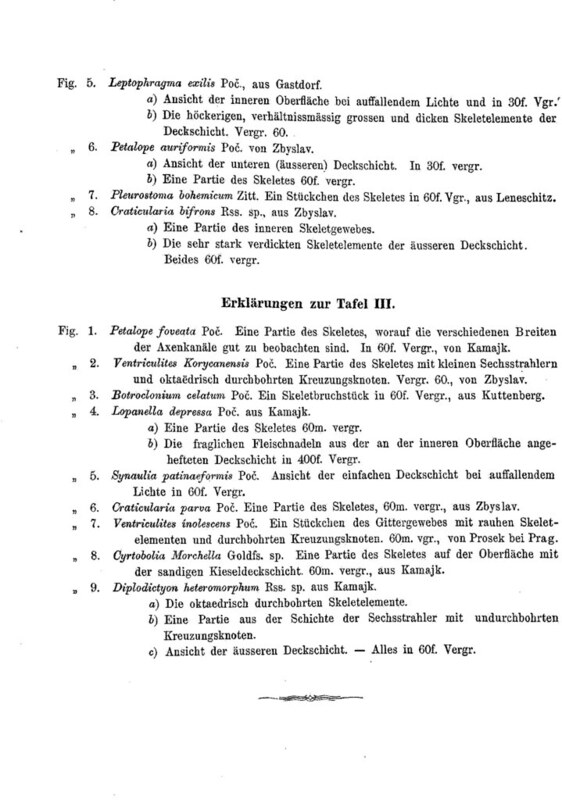 PDF: "Hinde, 1883. 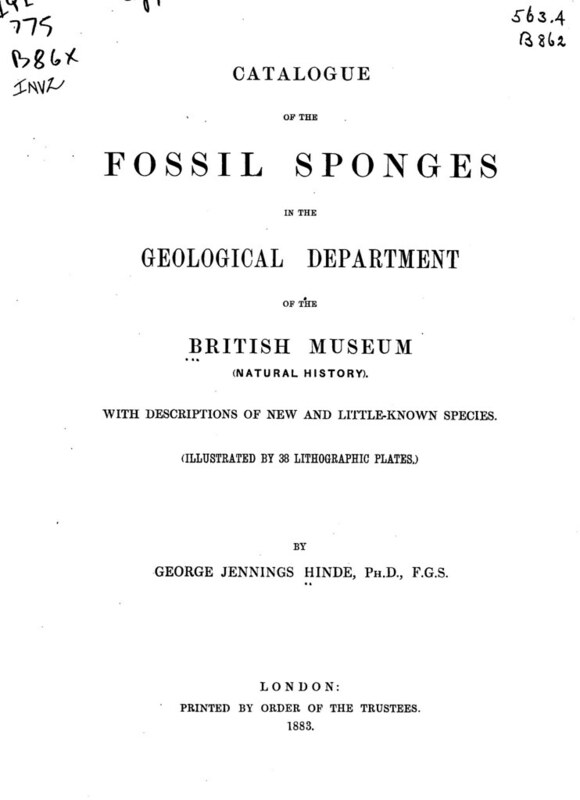 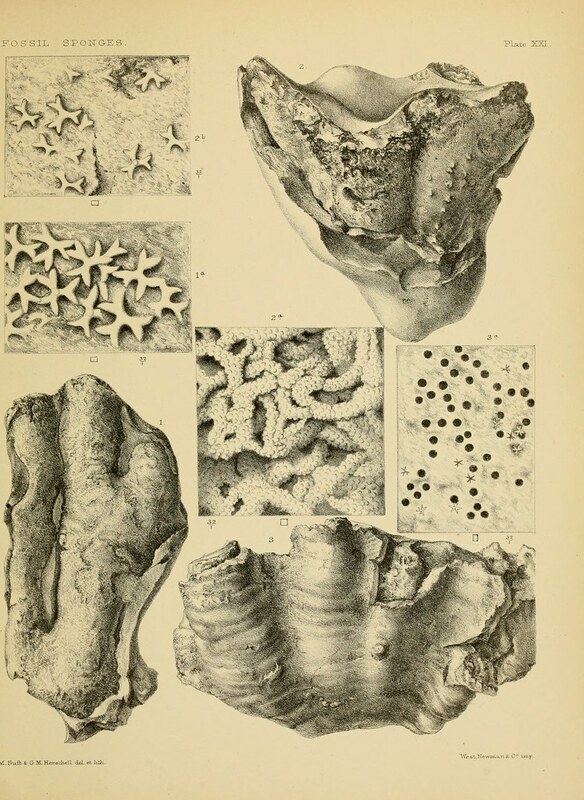 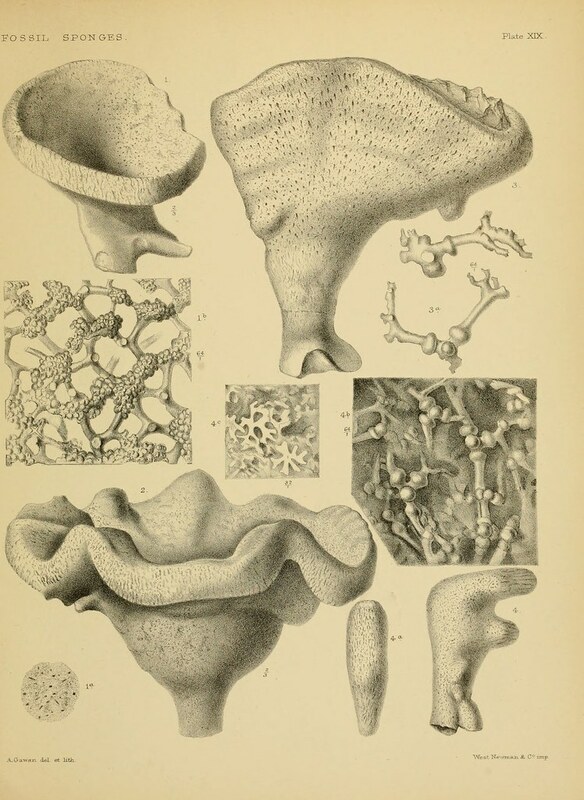 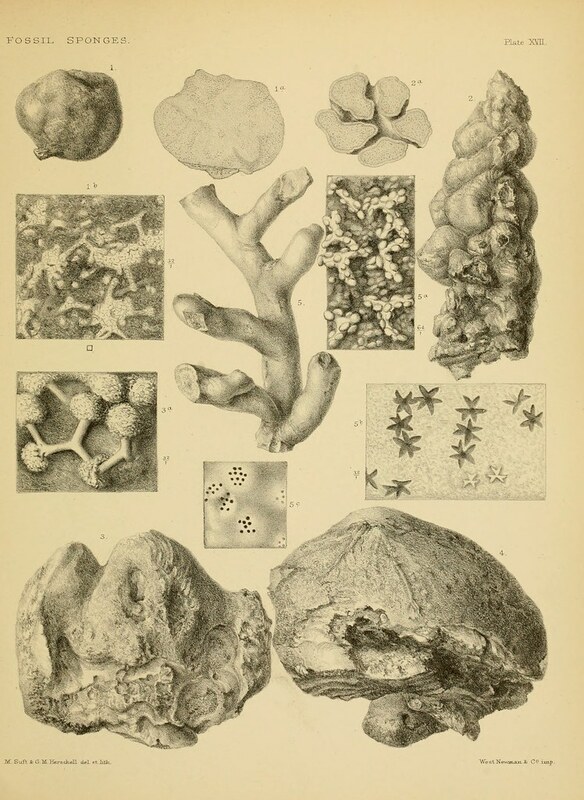 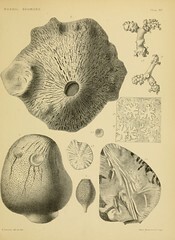 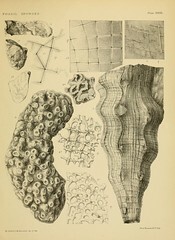 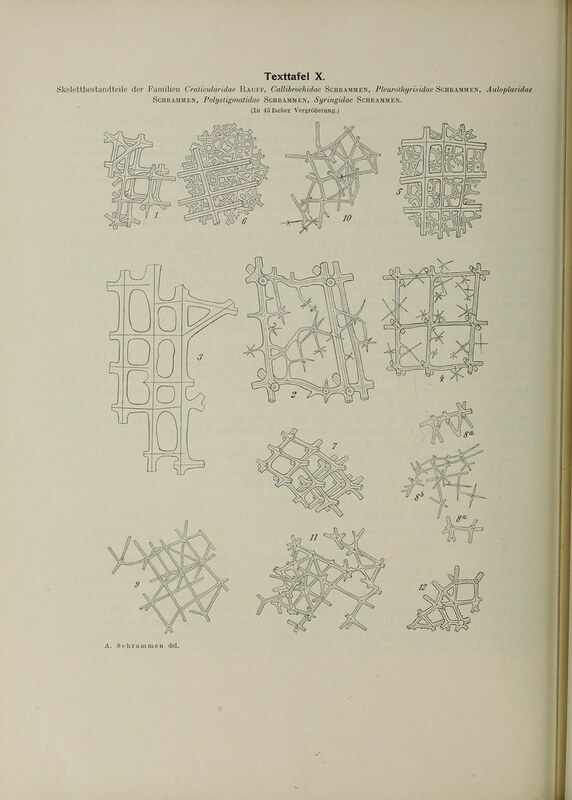 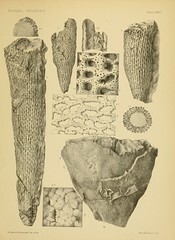 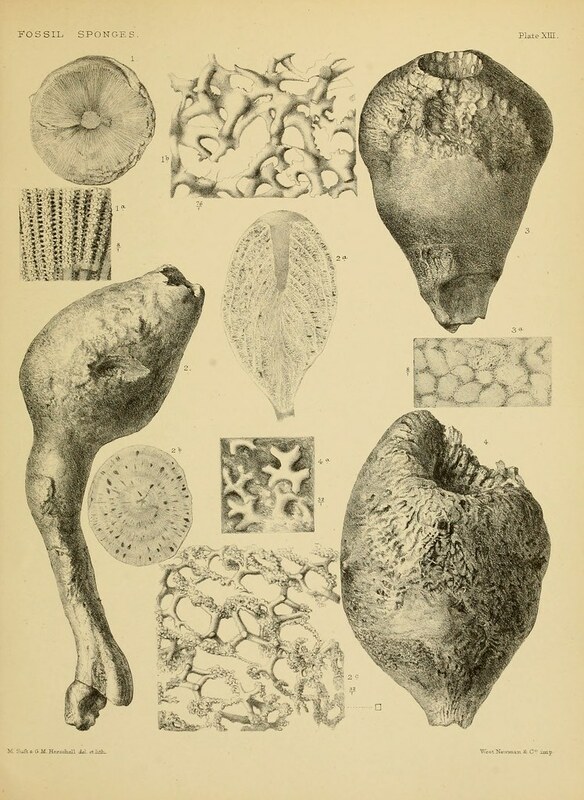 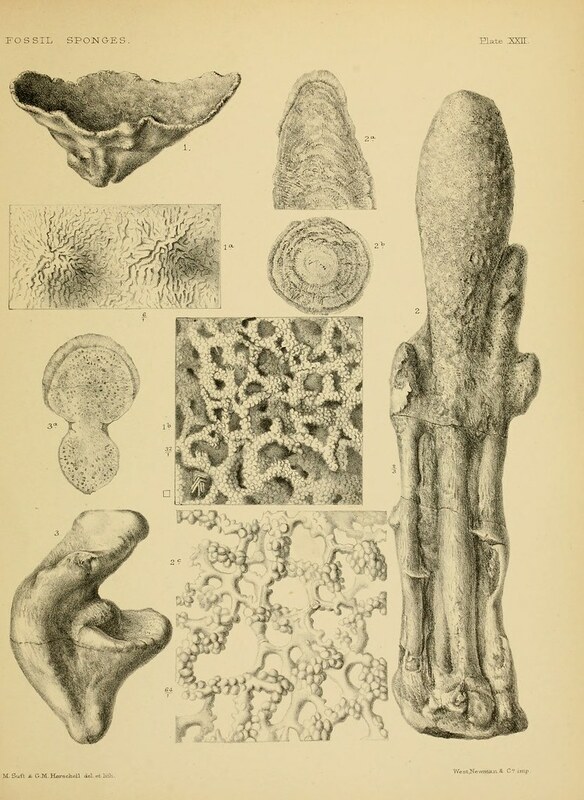 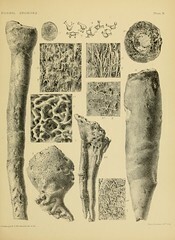 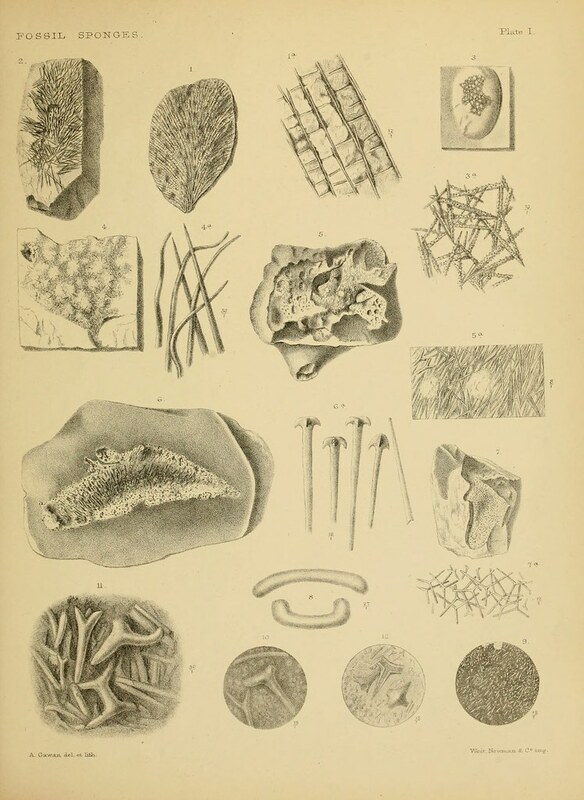 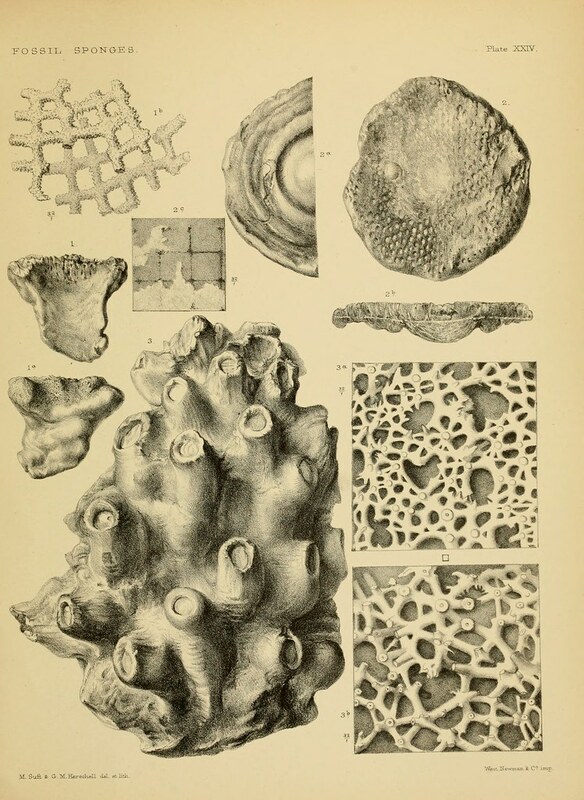 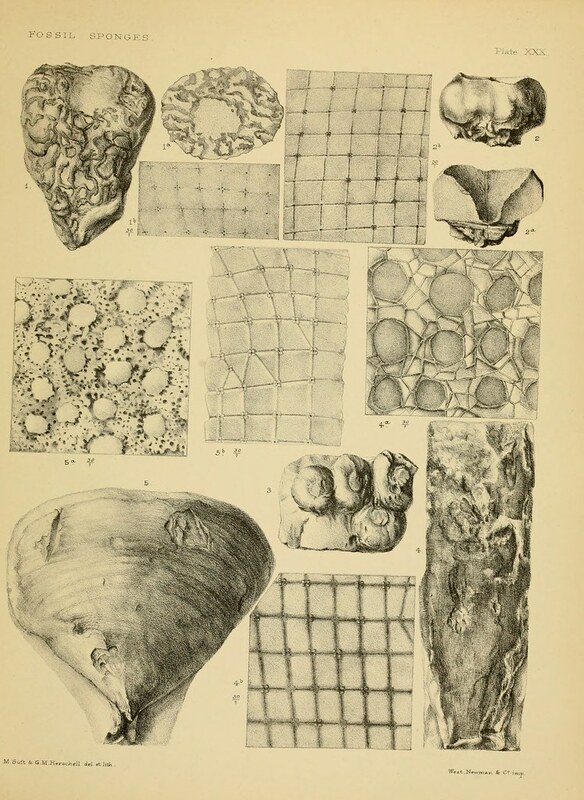 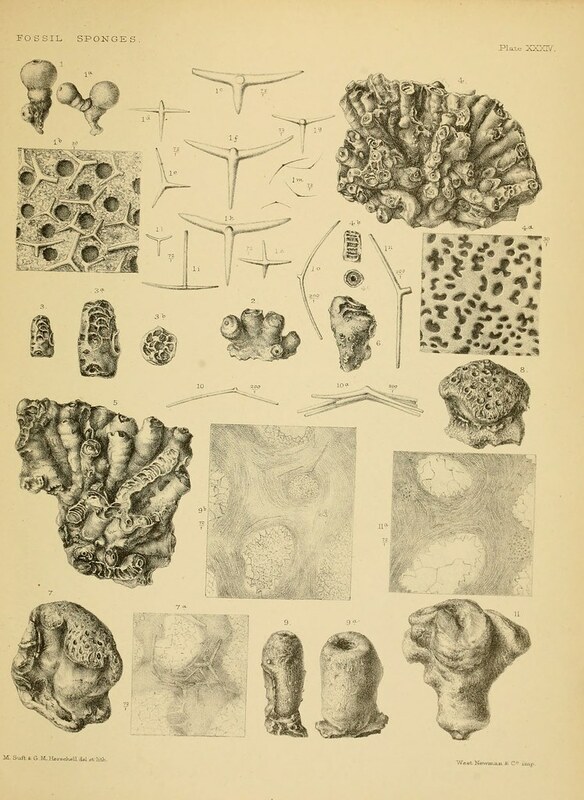 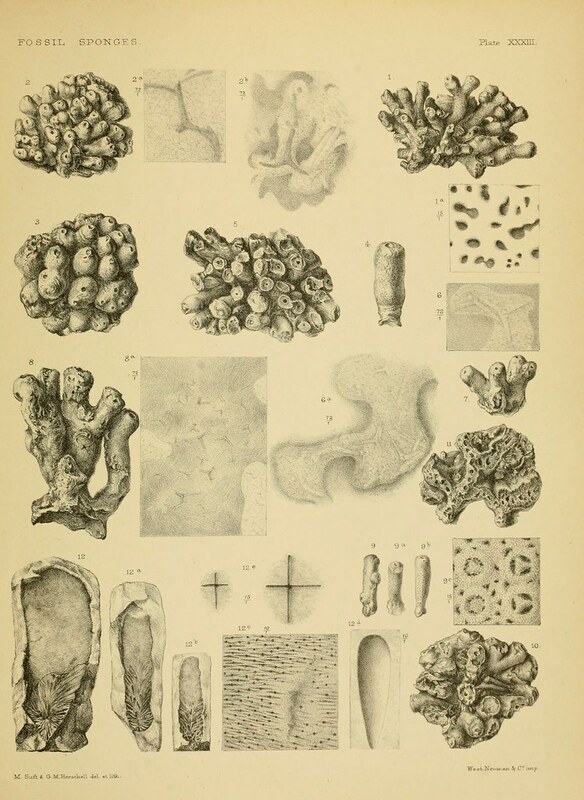 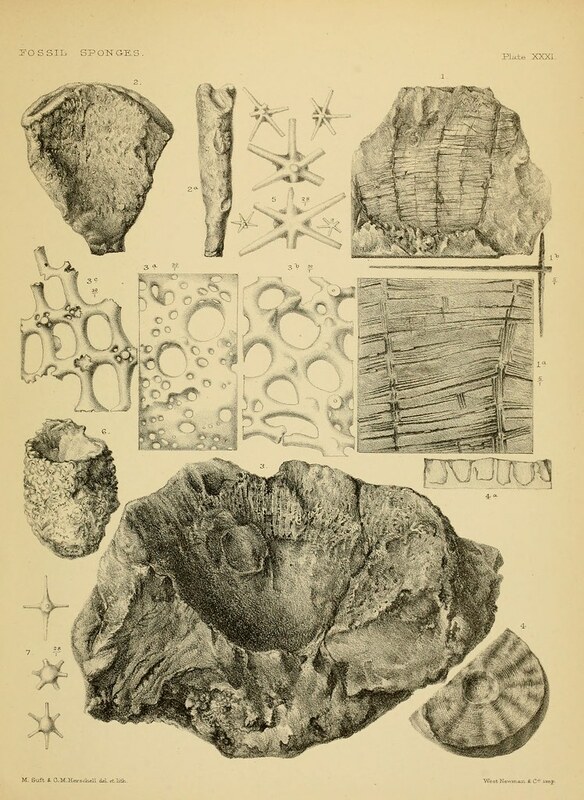 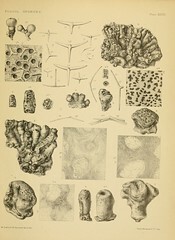 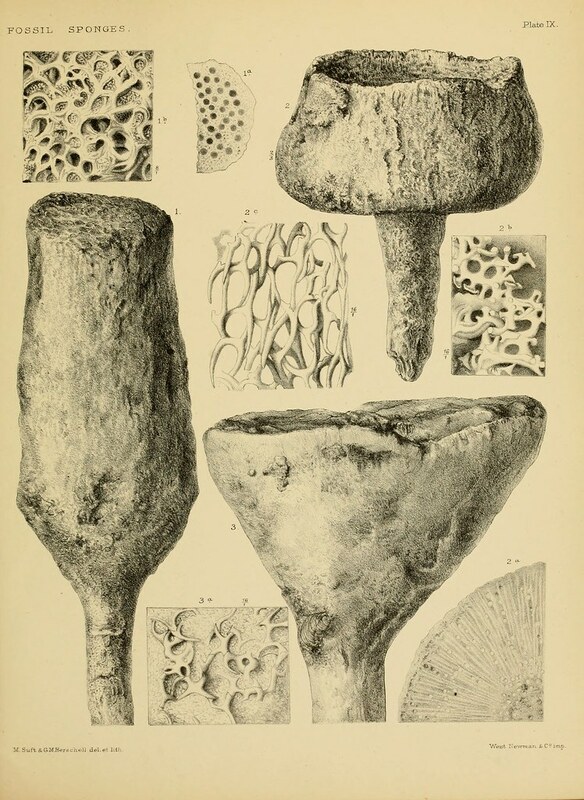 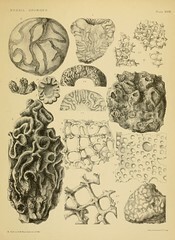 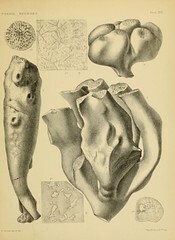 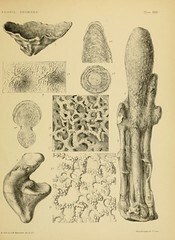 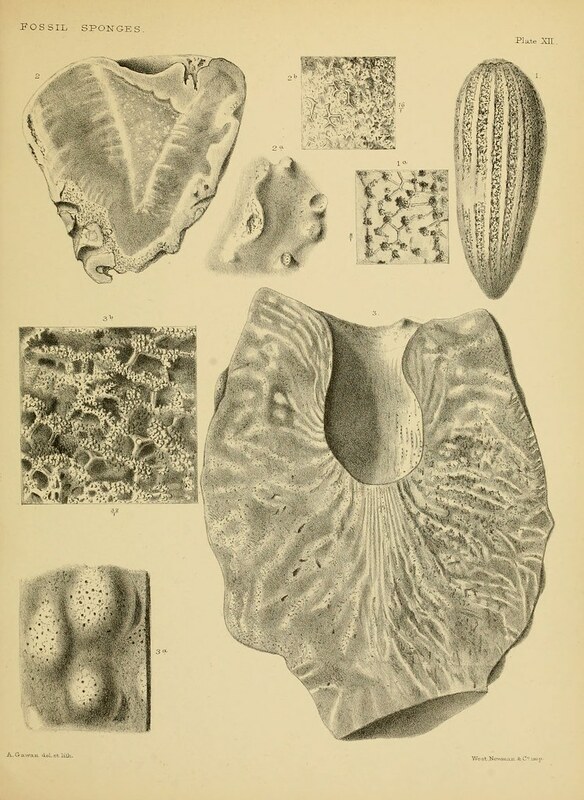 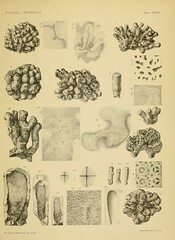 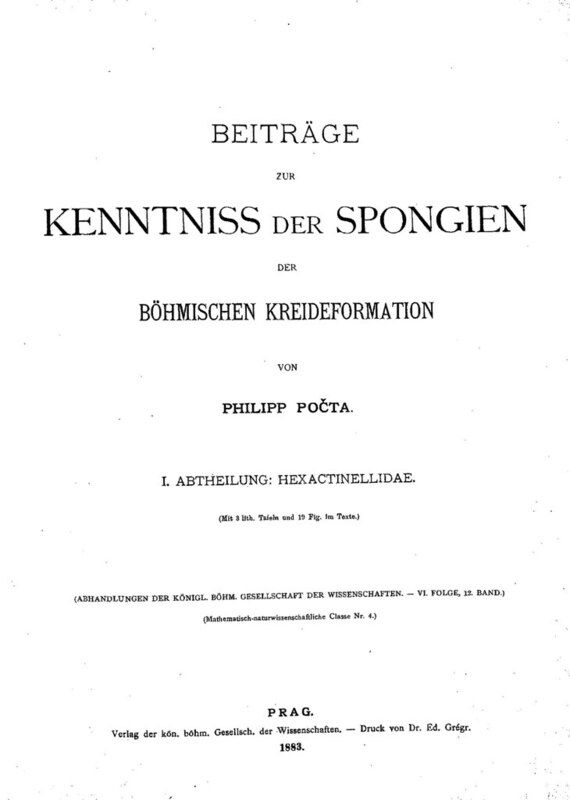 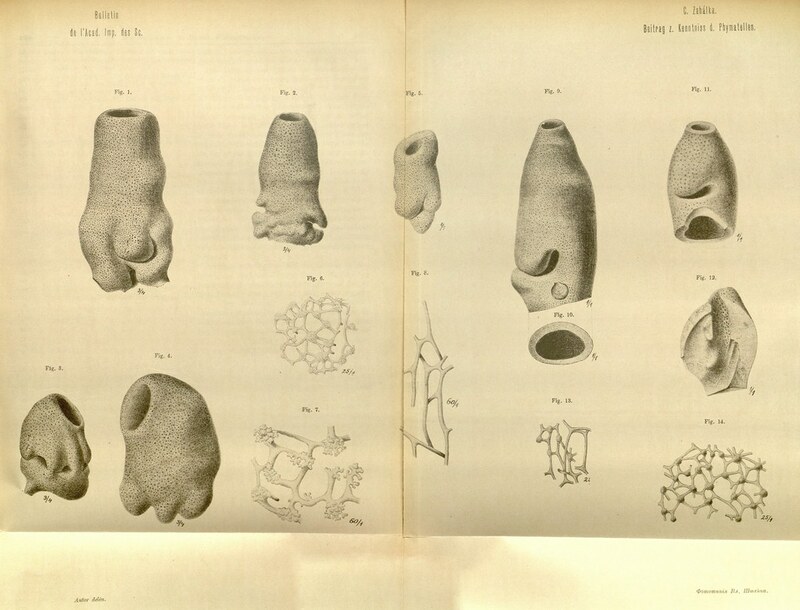 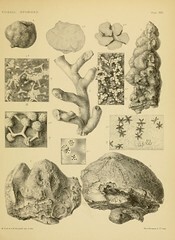 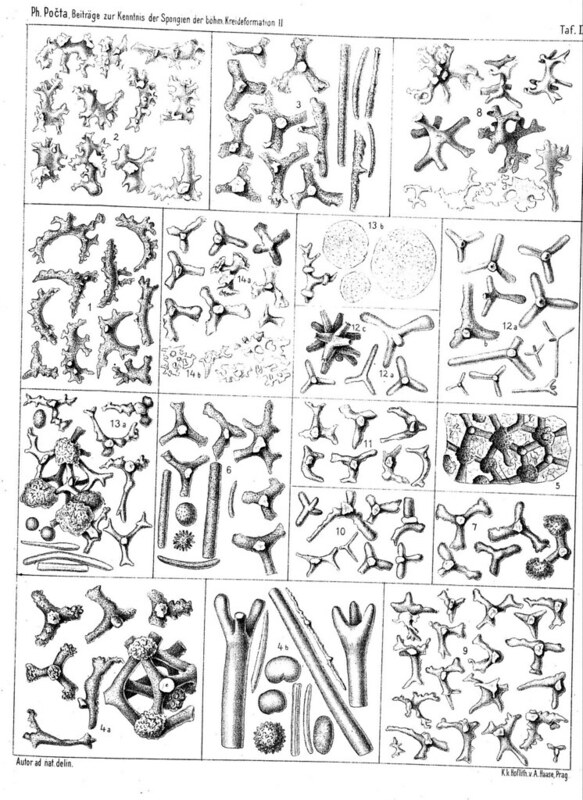 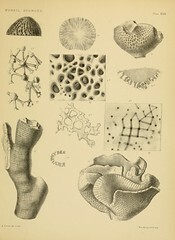 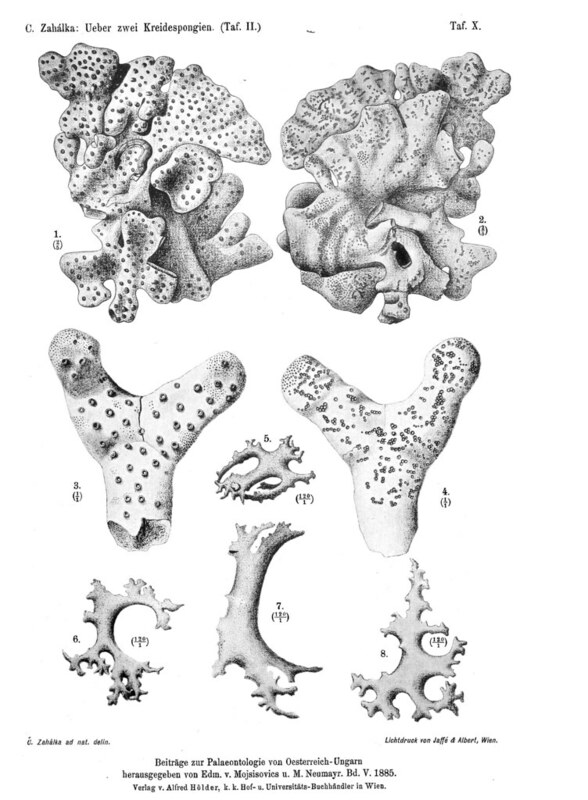 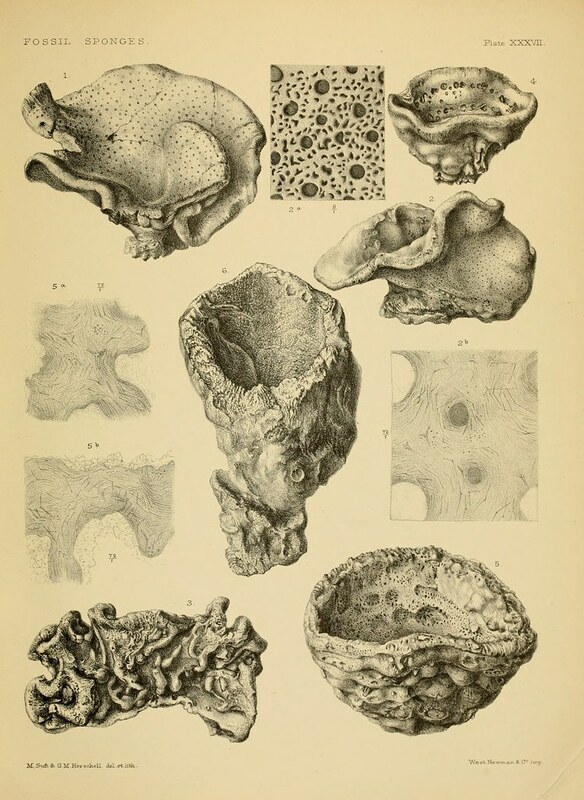 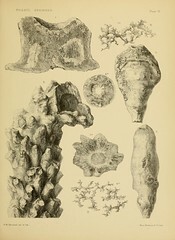 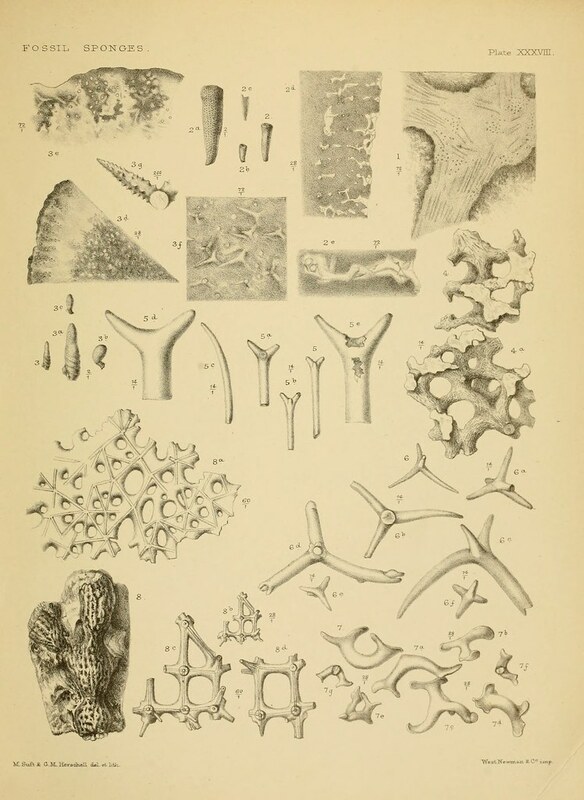 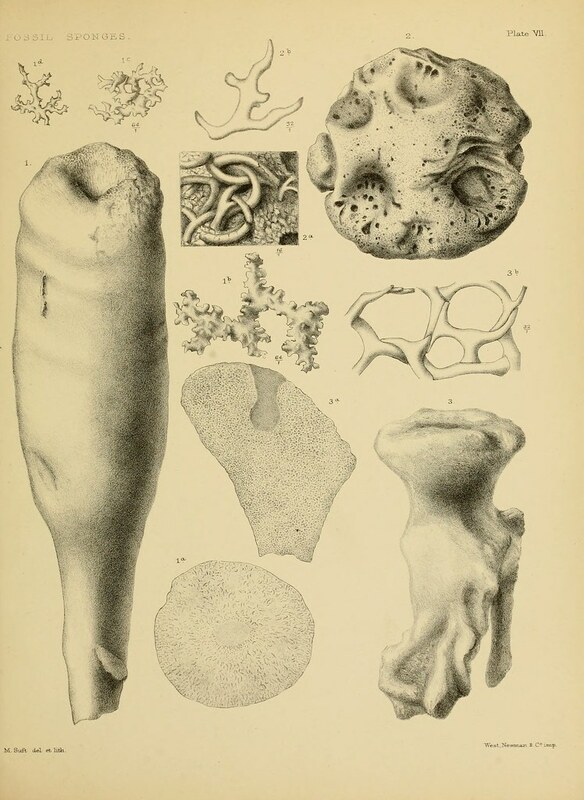 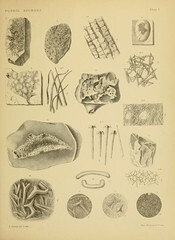 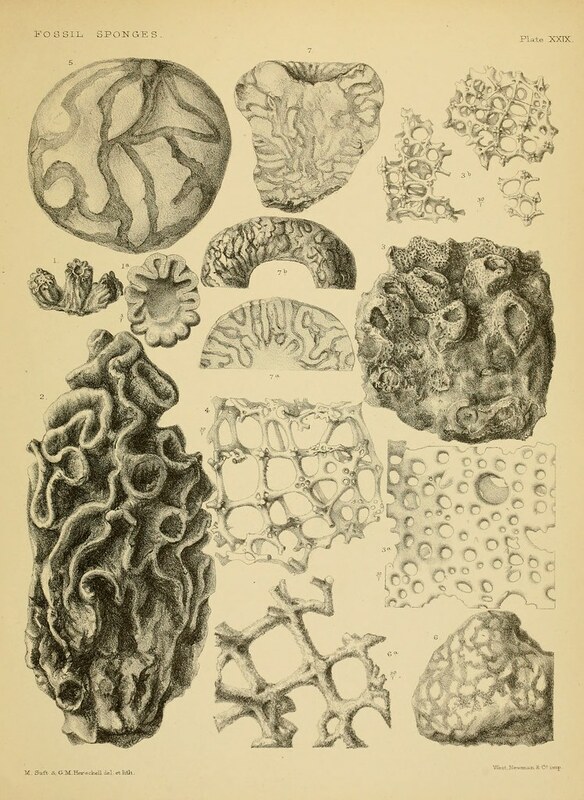 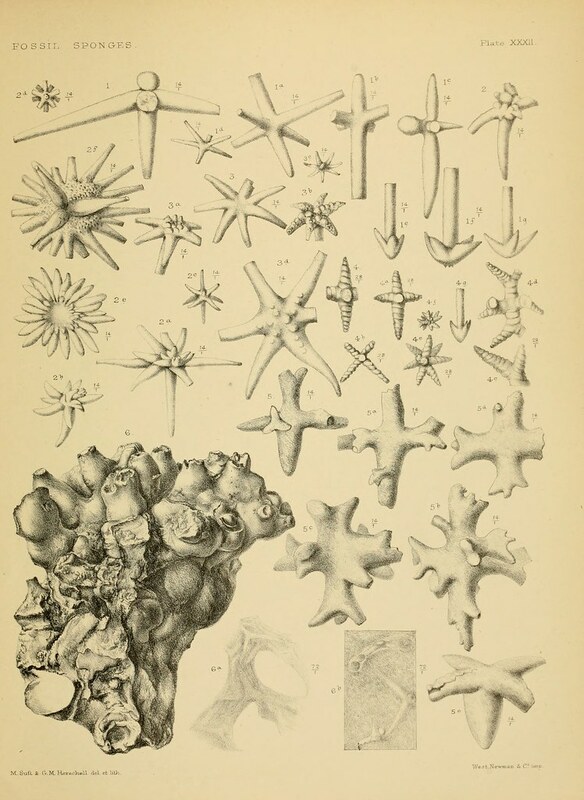 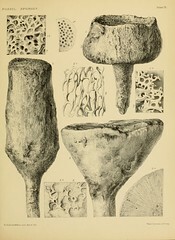 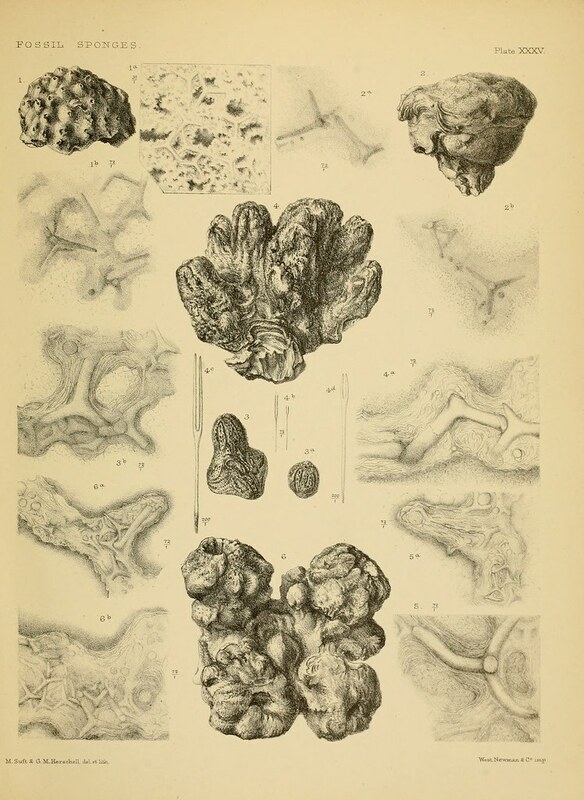 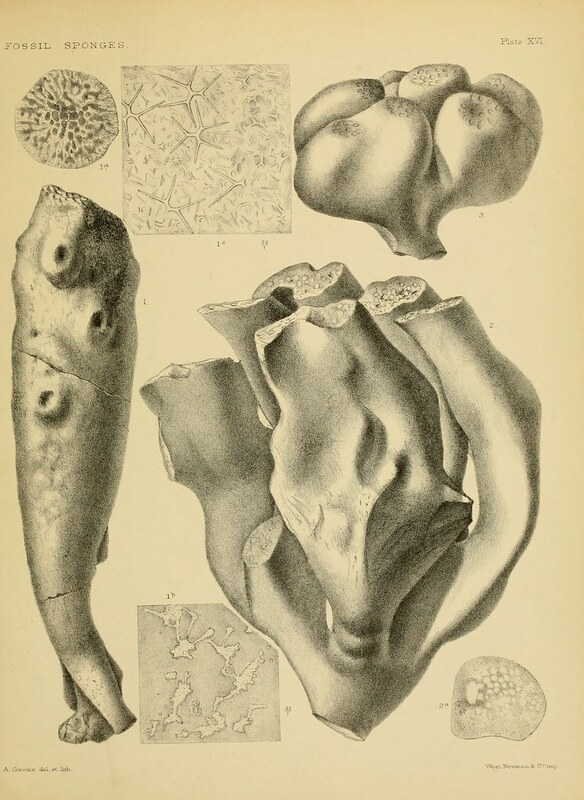 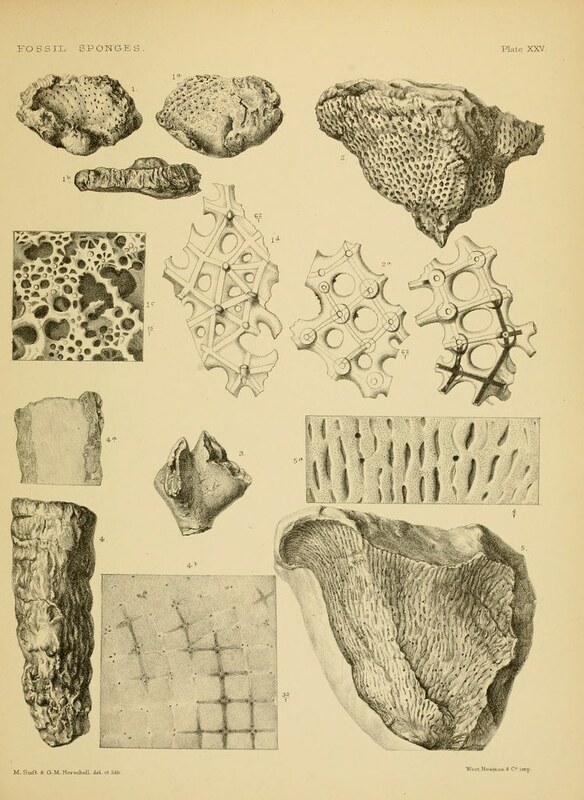 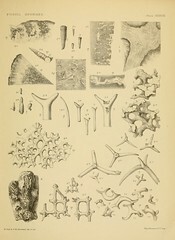 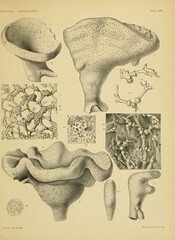 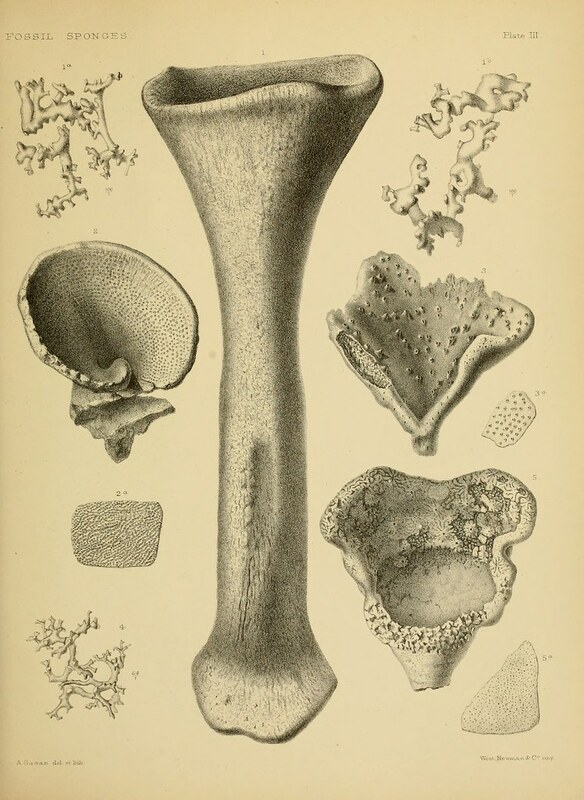 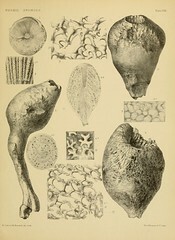 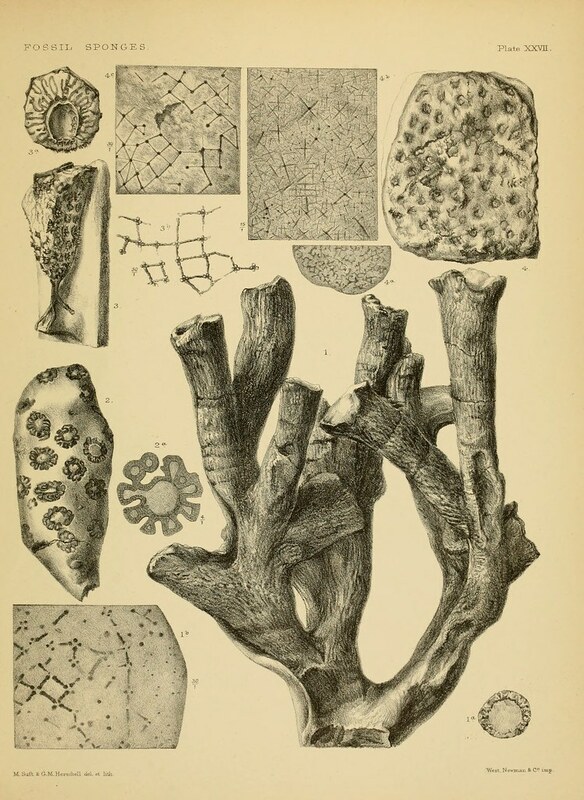 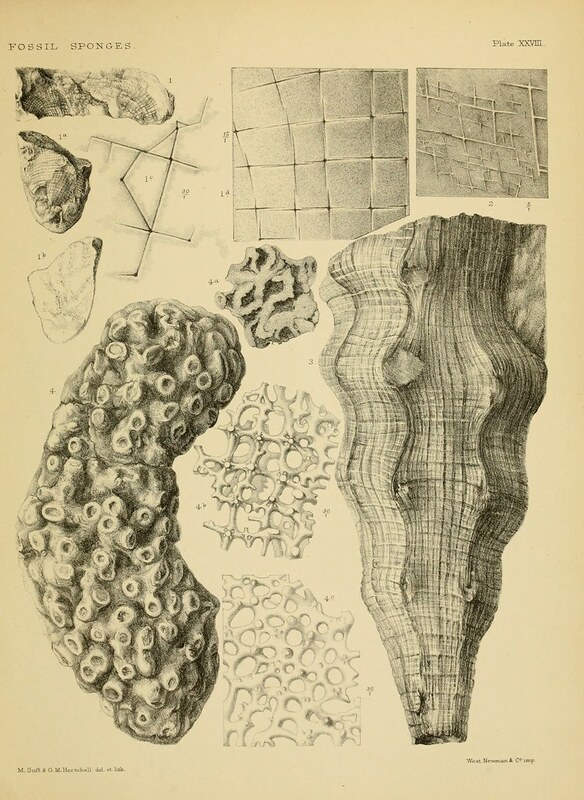 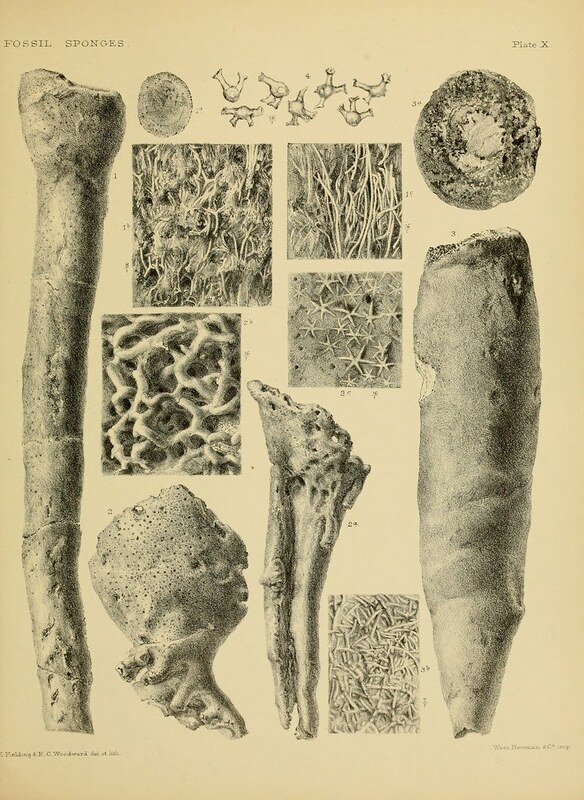 Catalogue of the fossil sponges"